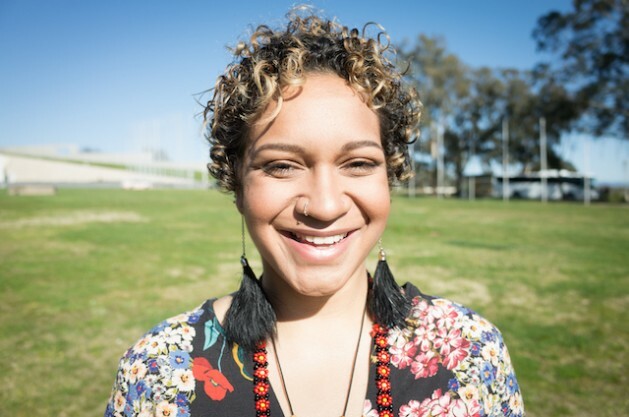 Murrawah Johnson, 21, of the Wangan and Jagalingou Family Council, is among those standing in the way of the huge Carmichael coal mine project in Australia's Queensland state. Photo courtesy of Murrawah Johnson. MELBOURNE, Dec 30 2016 (IPS) - Among those leading the fight against the massive Indian-owned Carmichael coal project in Australia’s Queensland state is 21-year-old Murrawah Johnson of the Wangan and Jagalingou aboriginal people, the traditional owners of the land where the proposed mine is to be located. “Our people are the unique people from that country,” says Murrawah, whose name means ‘rainbow’ in the indigenous Gubbi Gubbi language. “That is who we are in our identity, in our culture, in our song and in our dance,” she adds. The mine’s estimated average annual carbon emissions of 79 million tonnes are three times those of New Delhi, six times those of Amsterdam and double Tokyo’s average annual emissions. The Wangan and Jagalingou, numbering up to 500 people, regard the Carmichael coal mine as a threat to their very existence and have repeatedly rejected the advances of Adani Mining, the company behind the project. The traditional owners argue the mine would destroy their land, which “means that our story is then destroyed. And we as a people and our identity, as well,” Murrawah, a spokesperson for her people’s Family Council, told IPS. Adani Mining is a subsidiary of the Adani Group, an Indian multinational with operations in India, Indonesia and Australia cutting across resources, logistics, energy, agribusiness and real estate. In March, the company announced its first foray into the defence industry. Adani’s Carmichael project envisions a 40km long, 10km wide mine consisting of six open-cut pits and five underground operating for up to sixty years. The company intends to transport the coal to India to aid in that country’s electricity needs. According to the International Energy Agency, 244 million Indians – 19 percent of the population – are without access to electricity. Should the project go ahead, it would be the largest coal operation here – Australia is already a major coal producing and exporting nation – and among the biggest in the world, producing some 60 million tonnes of thermal coal annually at peak capacity. But at a time when global warming is a significant threat to humanity, the Carmichael mine is generating substantial opposition. Since the project was announced in 2010, there have been more than ten appeals and judicial processes against the mine. Shani Tager, a campaigner at Greenpeace Australia Pacific, is adamant that the coal that Adani wants to dig up must remain in the ground. “It’s a massive amount of coal that they’re talking about exporting, which will be burnt and used and make the problem of global warming even worse,” she says. Coal-fired power plants emit large amounts of carbon dioxide, a gas that traps heat within the Earth’s atmosphere and which plays an important role in the phenomenon of human-induced climate change. According to a 2015 report by The Australia Institute, a local think tank, Adani’s project would release more carbon into the atmosphere than many major cities and even countries. The report states that the mine’s estimated average annual carbon emissions of 79 million tonnes are three times those of New Delhi, six times those of Amsterdam and double Tokyo’s average annual emissions. It would surpass Sri Lanka’s annual emissions and be similar to both Austria’s and Malaysia’s. Despite these alarming figures, both the Australian and Queensland state governments are backing Adani’s Carmichael mine. There has been widespread speculation here that the federal government will provide support via a AUD one- billion loan (722 million U.S. dollars). The Queensland government, anticipating a boost to jobs, the regional economy and to its own coffers as a result of royalties, announced in October that it was giving the project “critical infrastructure” status in order to fast-track its approvals. “This Government is serious about having the Adani mine in operation. We want this to happen,” Anthony Lynham, state minister for mines, told local media at the time. In early December, Adani received what the state government describes as the project’s “final major” approval: Adani’s rail line to the port of Abbot Point, from where the coal will be shipped to India. In 2011, Adani signed a 99-year lease on the Abbot Point coal terminal, which sits immediately adjacent to the Great Barrier Reef Marine Park. Australia’s iconic reef is the world’s largest coral reef ecosystem and among the most diverse and richest natural ecosystems on Earth. In November, scientists from Queensland’s James Cook University confirmed the worst-ever die-off of corals in the reef, following a mass coral bleaching event earlier in the year. Heat stress due to high sea temperatures is the main cause of coral bleaching, with bleaching events expected to be more frequent and severe as the world’s climate warms up. Adani plans to significantly expand the Abbot Point terminal in order to ship larger amounts of coal. This means dredging up the sea floor right next to the Great Barrier Reef. “The Carmichael coal mine will have a domino effect of bad impacts on the reef, from driving the need for port expansion and more dredging and dumping to increasing the risk of shipping accidents on the reef,” says Cherry Muddle from the Australian Marine Conservation Society. The reef’s tourism industry provides some 65,000 jobs, with numerous operators also speaking out against both the Carmichael mine and the Abbot Point expansion in recent times. Despite Minister Lynham’s assurances that “200 stringent conditions placed on this project through its court processes” will protect the reef, others remain extremely concerned. “Adani has a really worrying track record of environmental destruction, human rights abuses, corruption and tax evasion,” says Adam Black from GetUp, a movement which campaigns on a range of progressive issues. Among the accusations leveled at Adani operations in India in a 2015 report by Environmental Justice Australia are the destruction of mangroves; failure to prevent salt water intrusion into groundwater; bribery and illegal iron ore exports; using political connections to purchase land cheaply; and obtaining illegal tax deductions. Adani’s CEO in Australia, Jeyakumar Janakaraj, was in charge of a Zambian copper mine owned by Konkola Copper Mines (KCM) when, in 2010, the mine discharged dangerous contaminants into the Kafue River. Found guilty, the company was fined around AUD 4,000 (2,900 U.S. dollars). Some 1800 Zambians have since taken KCM and its UK-based parent company, Vedanta Resources, to the High Court in London, alleging they were made sick and their farmland destroyed over a ten-year period from 2004. Janakaraj was with KCM from 2008 to 2013. Now, with Adani hoping to break ground on its Carmichael coal project in mid-2017, opponents are prepared to continue their hitherto successful campaign of dissuading potential financiers from backing the AUD 16-22 billion project (11.5-15.8 billion U.S.). “If they can’t get the money, they can’t build the mine,” says Murrawah Johnson. The Wangan and Jagalingou recently set up what they call a “legal line of defence” against Adani and the Queensland government, consisting of four more legal challenges, with plans to take the matter to the High Court if needs be. They have also been in contact with the United Nations for some time. For Murrawah, this battle is about maintaining connection with both the past and the future. “I refuse to be the broken link in that chain,” she says.